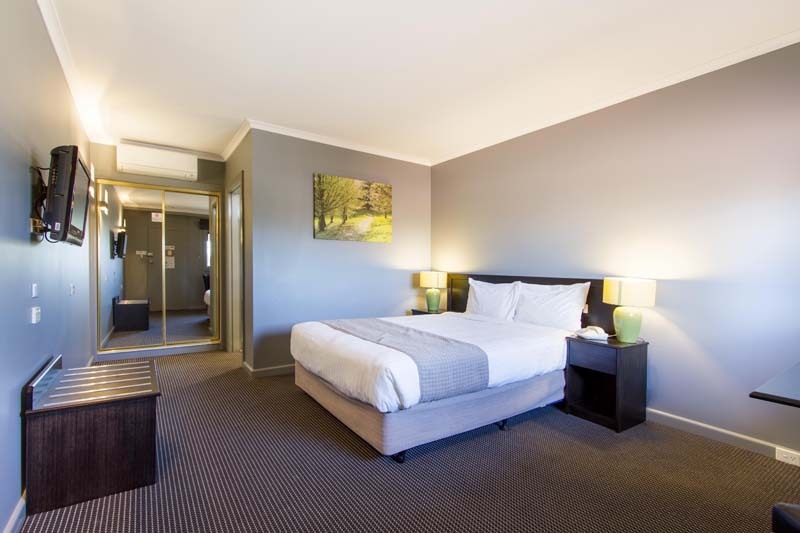 Ideally located in the heart of the Melbourne’s Western Suburbs, Sunshine Motor Inn offers a choice of accommodation and facilities to suit everyone. From our executive suite with a luxurious two person spa to our economical standard rooms, all needs are catered for. Sunshine Motor Inn offers 'In-Room' or 'On The Go' Breakfast Packs. Sunshine Motor Inn is located 800m off the Western Ring road which offers easy access to the city and the airport. Sunshine Motor Inn is doing its bit to combat fatigue amongst drivers by introducing two specialist 'Sleeping Driver Rooms' and 'Day Sleeping Rooms'. We removed the large front window from the front of the room and replaced it with a smaller double glazed window. The purpose of this was to reduce noise and so that we could install block-out blinds that well and truly over lap the side of the windows. We installed acoustic insulation in the new wall to help reduce the noises of the day. We painted the room a darker colour to help give the room a night time feel during the day. The room comes with all modern motel features including flat screen TV with Foxtel, Free Wi-Fi, Split system reverse cycle air conditioning. Executive Spa Suite - Spoil yourself with one of our Executive Spa Suites. The executive spa suite consists of a queen size bed and a sofa. The bathroom has a large corner spa to relax in after a long day. There is also Tea/coffee making facilities, table and chairs, mini bar, TV with free Foxtel, individual remote control air conditioning, hairdryer, phone, iron, bar fridge, and wireless internet. Our family rooms are equipped with all the facilities you need to enjoy a pleasant stay: TV with free foxtel facilities, individual remote control air conditioning, phone, iron, fridge, tea/coffee making facilities and wireless internet. 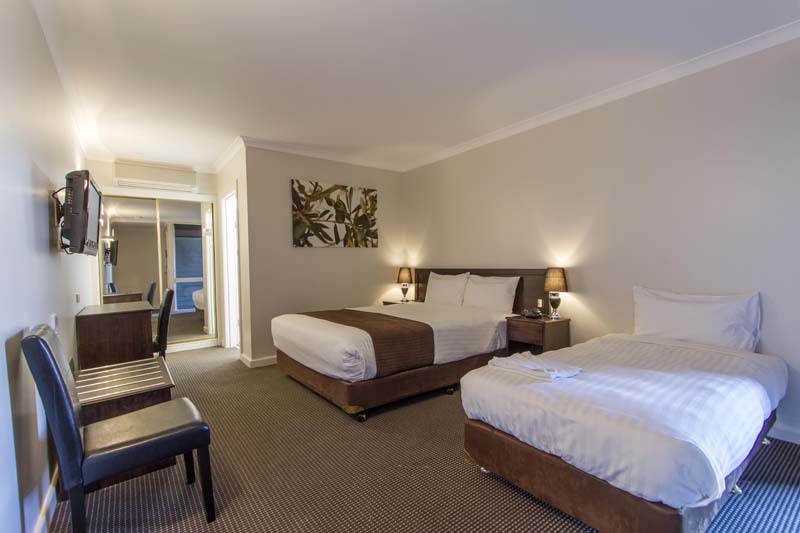 Our standard queen rooms have been tastefully renovated and are equipped with all the facilities you need to enjoy a pleasant stay: TV with free foxtel facilities, individual remote control air conditioning, phone, iron, fridge, tea/coffee making facilities and wireless internet. Our standard twin rooms (queen and single bed in the one room) have been tastefully renovated and are equipped with all the facilities you need to enjoy a pleasant stay. Our economy queen bedded rooms are equipped with all the facilities you need to enjoy a pleasant stay. Our economy twin bedded rooms are equipped with all the facilities you need to enjoy a pleasant stay. Blazed Bar and Grill lends itself exquisitely to any occasion whether it is a social gathering for a drink or to satisfy the discerning diner with that gourmet palate. We can accommodate you and your guest’s every need and be sure to make your next occasion an original and unforgettable one. Our talented chef offers a delicious and tempting Modern Australian menu with an Italian twist for you and your guests. Enjoy our $28 Succulent Steak special offer, any night of the week. Come and dine with us today, for reservations please contact us on 03 9363 1717. Our restaurant is open to the public as well as our guests staying with us. Room Service is also available. Please click menu button below for our current menu.